A new version of Google Duo is began rolling out earlier today. It doesn't look like any new features have gone live with this update, nor does it appear to restore the screen sharing feature that was briefly enabled a couple months ago. However, there are some new things to look forward to in the future, including what is likely a pause button for video chats and a reward system for inviting friends to use Duo. Whether you're in a video chat or just sticking to sound, Duo offers a button that can be used to mute your audio. It's there because there may be times that you don't want to end a call, but you might have to quickly respond to something else in private. The same can be true with video. Sure, you can cover up the camera lens easily enough, but that might not be convenient if you're on the move or need both of your hands. But now it looks like Duo may be adding a "pause" feature for video chats. 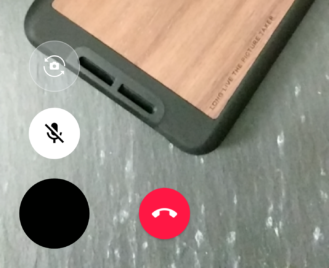 Two new lines have been added that should appear when the other side of a call has disabled their video. The first simply points out that the video feed is off, while the second is effectively an instruction to chatters that they can tell the other person in a conversation that they have to open up Duo to re-enable video. Judging by a new layout called video_paused_full_screen_ui.xml, the other end of the call will include just the profile picture of the person and the two messages above, along with a little video camera icon. So far, there aren't any changes to the control layout, but it seems safe to assume that the button to pause video will be located alongside the mute button. Google must really want to get more users on board with Duo, because it looks like we're about to see an even more aggressive marketing push. New strings clearly spell out a reward program built around inviting your friends to use Duo. There are placeholders for the specific rewards, so I can't say with any certainty what those rewards will be. Although, the generic gift card icon was added, which would make a lot of sense. It wouldn't be terribly costly to Google if it gave away a few bucks in gift cards to Google Play, but it might be a good incentive to get people to start video chatting more often. But this is just an educated guess, there's nothing too certain about it. Requirements for the program are also not listed. We can probably expect to see Google asking people to engage in a short chat session or go through enough activity to show the app wasn't just installed and promptly abandoned after receiving the invite. For that matter, the text doesn't clearly state that this will use the same invite system or if additional changes are coming, but we'll probably hear about that soon enough.